On Monday after work, I tried again. 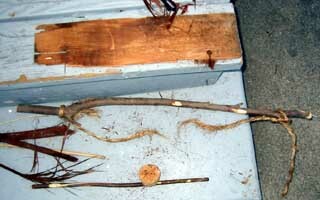 I found a branch with a bend in it and strung some natural fiber rope around it to make a bow. 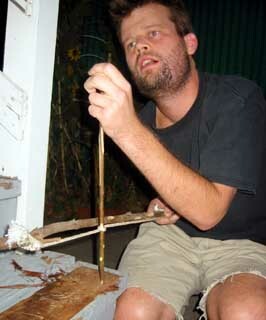 I also pressed a bottlecap into a piece of cork to make a socket for the top of the spindle. On an island I assume I could find a shell and a knot of wood somewhere to serve this purpose. I finally started working in the shade. I realized there was no point in exhausting myself in the direct sunlight if it was only going to benefit me 15 degrees or so. I also placed the entire operation on the stairs so that I was only half-squatting. This was much more comfortable. 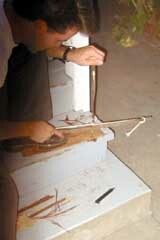 It took a couple of tries to get the rope tight enough to wrap around the stick one time and still be taut. 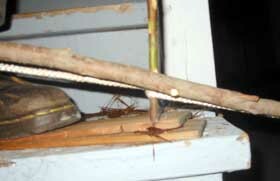 I was able to get the spindle stick turning, but it would sometimes slide around the stick without moving it. 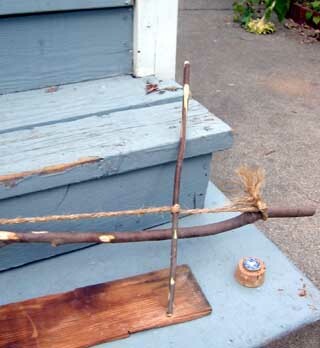 The spindle would also bend, especially if the rope was catching it too high. The bowing motion had to be very smooth or something would stutter and the operation would halt. A cellist might have an advantage here. 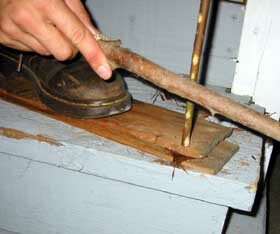 I used the fingers on my sawing hand to adjust the tension on the rope, but it wasn't much help. The fibers in the rope gave out after about 20 minutes of abuse. I had made a little black hole and a little bit of smoke. I found some thicker cotton cord and tried it again. On the island I would use my shoelaces for this operation, or maybe leather. Here is a photo of Mike giving it a try with his "stranded" beard. He sure gets into these little projects! Watching Mike sawing hard, I was afraid he would break the spindle. I warned him that I would kill him if he broke it now, on the brink of my success. This bending problem finally caught my eye as a serious problem. Joanne the ranger had given me a soft green branch, probably intending for me to dry it out first, but I hadn't realized it at the time. I recommend wrapping the rope so that the high-end of the rope is on the side close to you. 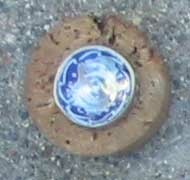 Here is a close-up of the bottlecap and cork I used at the top of the spindle. Eventually I put some oil on it to lubricate it so it wouldn't be uncomfortably hot. 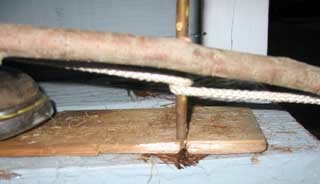 The new rope was better, but the spindle was too flexible. When I got a little smoke, I would start bowing faster and it would always start to bend and get too wobbly. 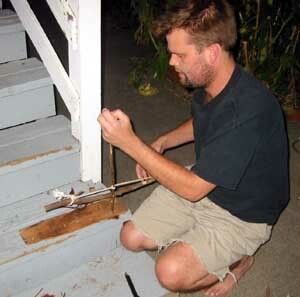 I did manage to spin all the way though my base-board and drill a little black hole into the stairs. Here I set up a second board as a tinder-holder and backup. Mike snapped a shot of my frustration here. 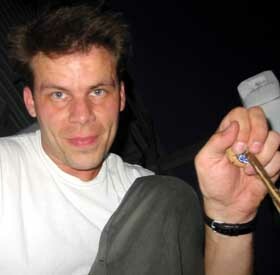 See how my fingers are poised around the bottlecap? It got pretty warm. It was getting dark, so I gave up for the day. This new method was showing great promise. I decided that I would give up on Joanne the Ranger's willow branch and find something a little straighter, dryer and fatter. My dad came over later that evening and listened to my progress. He thought it was pretty funny that I quit when it got dark. I was pretty sure I would succeed tomorrow. Contact Rob Sept 3, 2001.